The beloved characters of children’s author Arnold Lobel hop from page to stage in “A Year with Frog and Toad,” a story of adventure and friendship coming to the Chattanooga Theatre Centre stage March 23-31, 2018. A whimsical musical written by brothers Robert (music) and Willie Reale (book and lyrics), based on the “Frog and Toad” children’s stories written and illustrated by Lobel, the Theatre for Young Audiences production follows the woodland adventures of two amphibious friends, a curmudgeonly toad and a cheerful frog, with their colorful hopping, crawling and flying companions, over the course of a year. Following its premiere on Broadway in 2003, “A Year with Frog and Toad” was nominated for three Tony Awards, including Best Musical. The upbeat score entertains with plenty of wit, making it an inventive, exuberant and enchanting musical for the whole family. 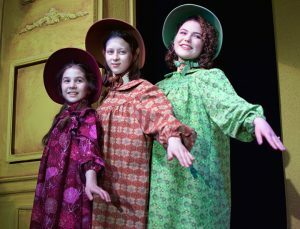 The production follows Frog and Toad through four colorful seasons, from hibernation to hibernation. Frog and Toad, along with their quirky friends Snail, Turtle, the Birds and more, go through many adventures, from rushing down a hill in a runaway sled in the winter to taking a picnic in the summer, learning life lessons along the way. The best friends celebrate and rejoice in the differences that make them unique. The adaptation is structured as joyful vignettes, which feature catchy tunes (such as Snail’s “I’m Coming Out of My Shell”), funny dialogue and bright, memorable characters. Two casts of young actors will perform on alternating days. The theatre typically selects two casts of young volunteers who perform on alternate days of the run, giving more young people the opportunity to take part in Youth Theatre productions. The “Summer Cast” includes Taryn Bracher (Snail), Benjamin Brown (Frog), Mason Carter (Toad), Landry Howard (Bird/Mother Frog), Aleah Larson (Turtle/Mole/Squirrel), Hannah Lowe (Lizard/Mole/Squirrel), Annabelle Major (Bird/Young Frog), Avery Sharpe (Mouse/Terrible Frog) and Augusta Westhoff (Bird/Father Frog). Sophia DeCredico is the stage manager, and Addison Carter is the assistant stage manager. The “Winter Cast” includes Tyler Bacon (Frog), Darrius Calloway (Toad), Erin Eames (Lizard/Mole/Squirrel), Alex Loyd (Bird/Young Frog), Acadia Phillips (Mouse/Terrible Frog), Genna Raborn (Bird/Father Frog), Autumn Schulmeister (Turtle/Mole/Squirrel), Emma Tuttle (Bird/Mother Frog) and Rachel Young (Snail). Carina Miller is the stage manager. The production is directed by Chuck Tuttle, the theatre’s Director of Education and Outreach. Grammy Award-winning composer Michael Huseman is the music director. School performances are scheduled March 26-29. Public performances are set for Friday, March 23, 7 p.m.; Saturday, March 24, 2:30 p.m. and 7 p.m.; Sunday, March 25, 2:30, p.m.; Friday, March 30, 7 p.m.; and Saturday, March 31, at 2:30 p.m. and 7 p.m.
Tickets are available by visiting the Theatre Centre box office (Tuesday-Friday, 9 a.m.-5 p.m.), by calling the box office at (423) 267-8534, or by going to TheatreCentre.com.